TOOWOOMBA'S aviation community lost one of its dearest and most innovative members when Terry Kronk's P-51 Mustang replica crashed near Helidon. It was supposed to be a day of celebration. The 52-year-old, a successful business and property developer, had just taken off from the Emu Gully airstrip when mechanical failure sent his plane back to the earth about 9.45am on Saturday. A man in his 30s, on-site for a first aid course, was hospitalised with minor burns and smoke inhalation after trying in vain to save the fallen pilot. Mr Kronk was on his way to the 100th birthday commemoration of the Toowoomba Aerodrome, where his famous Mustang replica was to be a showpiece. While the bulk of visitors to the aerodrome were oblivious to the tragedy, the downcast eyes of those who had heard the news told a story of great sadness. Darling Downs Sport Aircraft Association co-member Glenn Bruggermann was with Mr Kronk just after he decided to build the warbird. "We had our meeting at Terry's house one day about 12 years ago," Mr Bruggermann explained. "He took us to his shed and pointed, saying, 'See that engine and that sheet metal over there? That's going to be a Mustang one day.'" True to his word, the built-from-scratch plane became a favourite among flying enthusiasts on the Darling Downs and further afield. "He always said that when he went, he was going out flying," Mr Bruggermann said. Helidon plane crash: Successful Toowoomba builder and founder of the Emu Gully Air and Land Spectacular Terry Kronk has died in a plane crash near Helidon. Aerotec owner Lynette Zuccoli said a string of recent aircraft tragedies had begun to "numb" the close-knit flying community. Mrs Zuccoli lost her own husband to a plane crash and, more recently, close friend and David Hack Classic regular Des Porter and his wife Kath when their 1934 Dehavilland Dragon crashed south of Gympie last month. There were tears in her eyes as she remembered this latest victim of the skies whom she had known for more than 20 years. "He was in here just yesterday - he called in to see how everything was going," she said. "Terry was a genius when it came to building aircraft and he loved his work. "He could build an aircraft just by visualising it, drawing up the plans and putting it all together. "I believe it was a mechanical issue, so there was nothing he could do. "He was an excellent pilot." Mrs Zuccoli said her friend was an innovator who was looked up to as a leader in aviation circles. "The world needs people like Terry who take risks and do things out of the ordinary," she said. "They show us that things can be done differently." Mr Kronk had a lifelong fascination with flying, buying his first ultra-light at age 21 for a sum of $1200 in partnership with his brother. Once he started, he never looked back. His scale-replica P-51 Mustang, Focke Wulf 190 and Spitfire planes were renowned for the workmanship that went into their construction. Aerotec's chief engineer Wayne Milburn saw Mr Kronk on Friday. He was in a cheerful mood, looking forward to this morning's centenary celebrations. 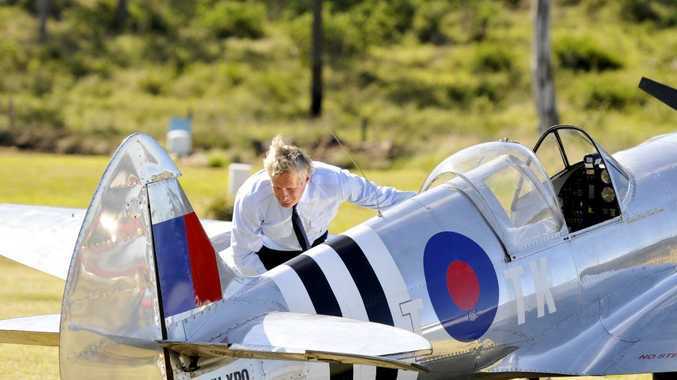 "He supported nearly every event held in aviation, not just here but all over Australia," Mr Milburn said. The company's chief flying instructor Matt Handley called his lost friend a "great guy". He recalled watching with admiration at the unfolding of Mr Kronk's lasting legacy, the Emu Gully Air and Land Spectacular. The event he helped to found has become Australia's largest re-enactment of Anzac war history. "He had a great community spirit with a real enthusiasm for teaching future generations about the sacrifices our troops have made in conflicts throughout history," Mr Handley said. "Through restoring and building military vehicles and plans, he was able to educate. "Terry was just a nice bloke." Home-built Mustang replica flies: Terry Kronk's home-build P51 Mustang replica flies at a previous Emu Gully Air and Land Spectacular. Video: Martin Hone - YouTube. The only consolation for many of his friends was that Mr Kronk died doing what he loved. "There are very few of us involved in the aviation industry that have not lost friends over the years," Mr Handley said. Mr Kronk is survived by his wife and three daughters. Martin Hone: It is my very sad duty to inform you that my friend Terry Kronk had an engine failure on take-off this morning. It seems the re-drive failed and he had to put it down in bushland. He was deceased before rescuers could smash open the canopy and pull him from the subsequent fire. I have just returned from the scene and Chris and I are both in shock. We had arranged for Chris to ride in the back to get some more video but we postponed it, fortunately. Another sad day for flying in Queensland. Arfa Winmill: Today australia and the world lost a great man. Terry Kronk lost his life when his replica P51 Mustang plane came down, through no fault of his own or his engine. He was a great human being and role model through his enthusiasm and tireless work designing and building replica war planes at Emu Gully Outdoor adventure training complex. He is survived by his two daughters and his wife. Our thoughts go out to these 3. The communities that Terry was involved with will feel this great loss for a long, long time. He will never be forgotten in our minds for the great person Terry was. Terry was also one of the driving forces behind the awesome and now world renowned enterprise that is the" Air and Land Spectacular" held in May at Emu Gully. RIP Terry Kronk. Peter Gardiner: Shocked, Terry Kronk, what a sad loss, my symphathy to his family and his wide group of friends. Alyce Kronk: Rest in peace Terry Kronk. Our prayers are going out to your immediate family. Your wife and your daughters will miss you as will many of us. Extremely sad situation. Gred Amey: Very sad news today, Terry Kronk one of the Respected founders of the Emu Gully Land & Air show at Helidon in QLD was killed when his P-51 replica plane crashed. My heart & thoughts are with his family and daughters today. His zeal and push for Australian history was an ever inspiration to us all who knew him. Marie Van Straten: Rest in peace . Spook Hetherington: Fly on Terry..